We used fluorescence in situ hybridization to probe the physical organization of five simple sequence repeat motifs and the Arabidopsis-type telomeric repeat in metaphase chromosomes and interphase nuclei of chickpea (Cicer arietinum L.). Hybridization signals were observed with the whole set of probes and on all chromosomes, but the distribution and intensity of signals varied depending on the motif. On root-tip metaphase chromosomes, CA and GATA repeats were mainly restricted to centromeric areas, with additional GATA signals along some chromosomes. TA, A and AAC repeats were organized in a more dispersed manner, with centromeric regions being largely excluded. In interphase nuclei of the inner integument, CA and GATA signals predominantly occurred in the heterochromatic endochromocentres, whereas the other motifs were found both in eu- and heterochromatin. 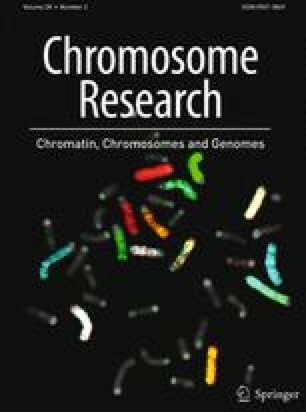 The distribution of the Arabidopsis-type telomeric repeat (TTTAGGG)n on metaphase chromosomes was found to be quite exceptional. One major cluster of repeats was spread along the short arm of chromosome B, whereas a second, weaker signal occurred interstitially on chromosome A. Only faint and inconsistent hybridization signals were visualized with the same probe at the chromosomal termini.